Double Knockout Red Rose Shrubs are flowering shrub roses that raise the bar when it comes to the amount of blooms on the plant. More than twice the amount of its single sister Knockout® Red Rose. The petals of this red flowering shrub present a fuller, richer pinkish-red inflorescence that is simply breathtaking. Without dead-heading these amazing flowering shrubs, the double red blooms maintain a continuous spectacular show of color from early June to hard frost with beautiful foliage almost year-round. The new growth is a dramatic burgundy red. Double Red Knock Out® Rose PP#16,202 is a denser, more compact rose shrub and upright with a broad, spreading form. This member of the Knockout® roses puts a great deal into its value as a landscape rose, from its four season appeal to its natural resistance to black spot, as well as other diseases and insects. The color at seasons end is exceptional with rich burgundy leaves in the fall and bright orange-red hips that add color during the bleakest of winter months. 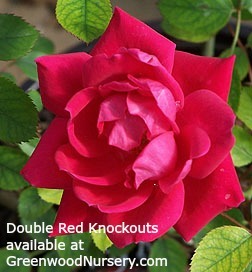 Double Red Knockout® Rose is a spectacular fast growing flowering shrub addition to any garden. Along with the eye-catching blooms and superior performance it offers wonderful versatility of use-from specimen planting to several planted among your favorite perennials, or an ideal way is to plant them as an appealing hedge. Everything we love about the Knockout® rose you will love about the Double Red Knockout® Roses with even more winter hardiness, improved shade tolerance and reduced height and width. So be the first in your neighborhood to display this beautiful rose and order quickly. These are available in extremely limited quantities. Knockout Roses Double Red flowering shrubs ship as one gallon container grown plants.